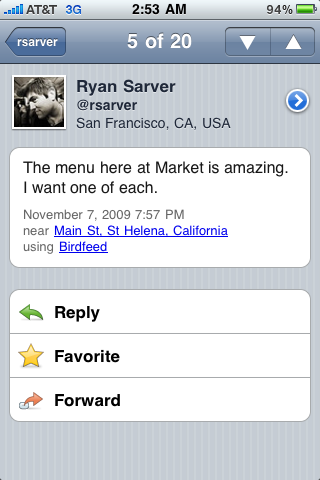 Back in June, we wrote about Birdfeed, an iPhone Twitter application that finally brought the speed and simplicity to rival what many consider to be the top client, Tweetie. It’s a great app that offers a different look and feel from Tweetie (and especially now Tweetie 2), which some users prefer. 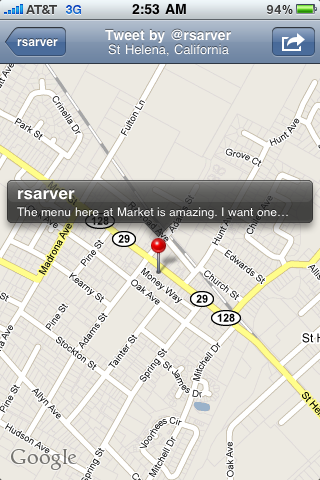 And it’s about to gain a key feature which could further differentiate it: Geolocation. Now, to be clear, as we previewed last month, the upcoming version of Tweetie, 2.1, will also support Twitter’s new geolocation feature. 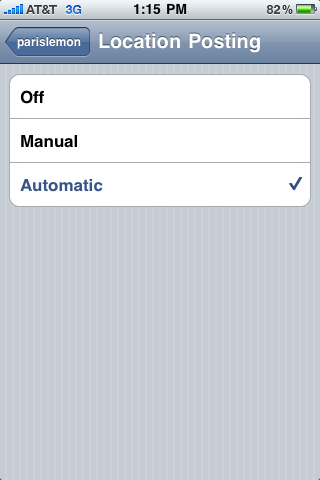 But the new version of Birdfeed, 1.2, does it in a way that highlights it much more. And in fact, when Twitter geolocation support finally does roll out (it’s due very soon, we hear), Birdfeed has a good shot to be the go-to app for it at launch. So what’s so good about it? Well, unlike Tweetie 2.1, which forces you to click into a menu system to get at the geolocation feature, Birdfeed puts it front and center at the top of every tweet composition screen. If you opt-in to using the feature (and it’s important to note that Twitter geolocation is opt-in), you can choose to either tweet with your location sent out each time, or use it on a tweet-by-tweet basis. 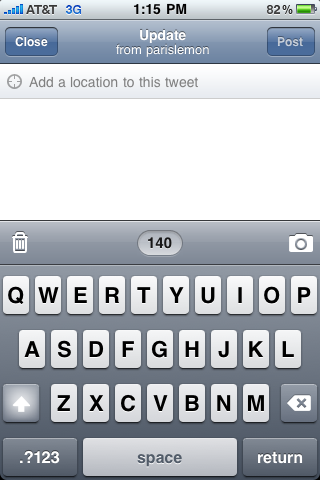 If you choose the latter, you’ll see a bar along the top that reads, “Add a location to this tweet”. Clicking on that with start a “Determining location” function, and in a few seconds, you’ll have your location pinned to the top of that tweet under which you’ll write the actual tweet. Simple. Currently, there isn’t any granular support to pick and choose how much or little detail of your location to show (what city you’re in versus what block you’re on, for example), but I suspect that may be something coming from Twitter’s end once geolocation launches. On tweets sent out with this geolocation data, you’ll see a hyperlinked location beneath the timestamp on the tweet’s landing page. Oddly, there is no obvious way to tell which tweets are geotagged and which are not from the main stream, currently. If you click on this location on the tweet screen, you’ll be taken to that location on a map and show a marker with that Twitter user’s name and their tweet on top of a Google Map. Birdfeed 1.2 was submitted to the App Store for approval 2 days ago, developer Buzz Andersen tells us. He remains committed to improving the application going forward, but notes that it has been slow going because he has other projects he’s currently working on as well. Still, Birdfeed is just as solid as it was several months ago and now with great geolocation implementation, could well see a spike in usage from the LBS lovers. Watch for it in the App Store sometime in the next couple of weeks.